As Arlington’s bus service grapples with a shortage of drivers, the company responsible for doing the hiring says it’s bumping up starting salaries to lure more applicants. Arlington Transit told riders last week that a lack of bus drivers has been a prime factor in a series of service delays over the last few months, putting most of the blame on the National Express Transit Corporation, the company that employs the drivers. The bus service lamented that it’s “lost a number of bus operators to other companies in the region, and the resulting operator shortages are contributing to many missed ART trips each day.” With a tight labor market, it’s a problem that many bus services around the country have been experiencing recently, analysts say. But National Express is taking new steps to remedy the problem, according to company spokesman Ed Flavin. He told ARLnow that the contractor recently “implemented a considerable increase to our starting wage in cooperation with our local labor union,” which went into effect on Jan. 1, in order to reverse this trend. Flavin did not answer follow-up questions about the size of the salary bump, or what sort of resulting increase in hiring the company has seen. However, online job advertisements show that National Express is currently offering $20 per hour for new bus drivers, so long as they have at least one year of “commercial driver” experience. By contrast, the contractor working with the neighboring Fairfax Connector service is currently offering anywhere from $17 to $19 per hour for entry-level drivers. In the meantime, ART has still recorded some serious service issues. The “ART Alert” Twitter account, which announces all bus delays and cancellations, shows that the service has experienced 47 missed trips or other delays since Monday alone, though some of those problems are attributable to Tuesday’s snow and mechanical issues. 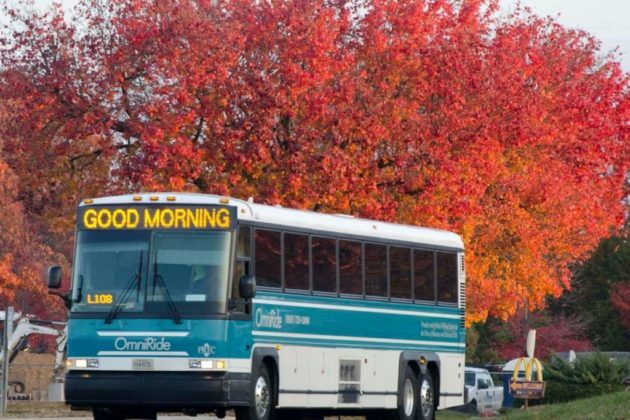 The bus service has indeed struggled with maintenance issues in recent months as well, in addition to problems with its real-time tracking service and phone service for disabled and elderly riders. Arlington’s bus service says a shortage of drivers and persistent maintenance problems are to blame for its struggles in providing consistent service these last few months. Arlington Transit issued a statement to riders this past Friday (Jan. 18), explaining that some problems with the service’s contractor have caused a variety of “missed trips” recently. ART last experienced similar problems this past June, when it commenced an expedited round of safety inspections. At the time, county officials also chalked up many of the problems to the age of its buses, though it was able to bring on 13 new buses this summer. A spokeswoman for National Express did not immediately respond to a request for comment on these issues. ART has contracted with the company dating back to at least 2012, when National Express acquired a contract to provide ART service as part of the acquisition of the county’s old contractor. 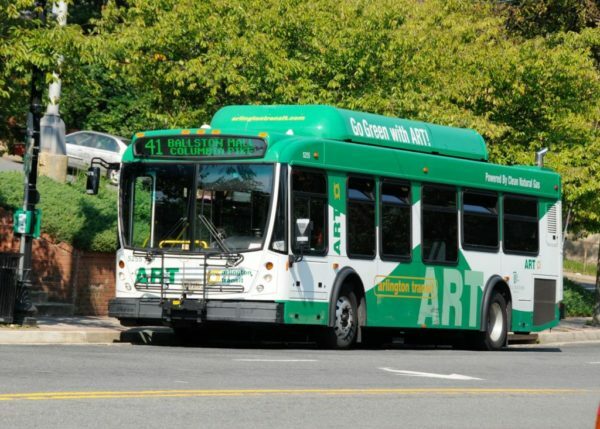 The “ART Alert” Twitter account, which announces all bus delays and cancellations, reveals that bus service has indeed been inconsistent recently. The bus service reported 55 missed trips, mechanical issues or other delays over the course of the last week alone, according to the account, with routes running all across the county affected. “It is a statewide, regional and national issue, especially with unemployment so low,” Clarkson told ARLnow. These service disruptions are simply the latest woes for ART, following a tough few months. Technical problems have also plagued its real-time bus tracking service in recent weeks, while its phone system to connect disabled and elderly riders to bus service crashed briefly this summer. Arlington Transit’s real-time bus tracking service has been plagued by more technical difficulties this week, and county officials say they’re still unsure when they’ll find a permanent fix. ART notified riders Wednesday morning (Jan. 16) that it was experiencing “intermittent problems” with the service, which is designed to let riders know how long they need to wait for another bus to arrive. The county’s bus service sent out a similar advisory on Jan. 7, and on two different occasions in October as well. Last April, the bus service even saw several days-long outages of the system. 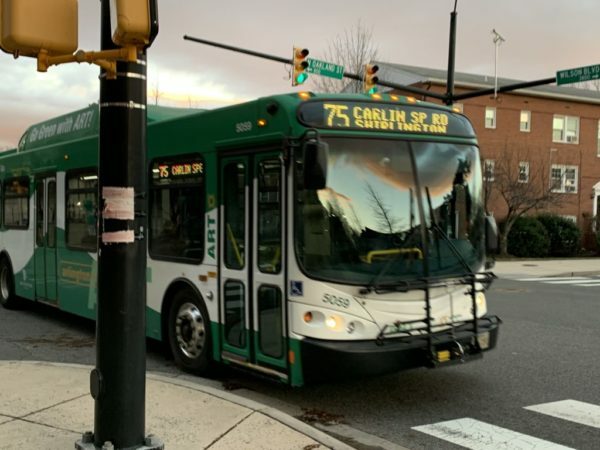 County transportation spokesman Eric Balliet told ARLnow that Arlington’s Transit Bureau is currently in contact with the vendor who manages the software, California-based Connexionz. 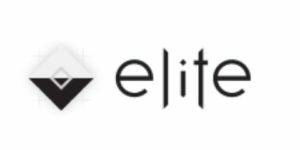 Balliet said the company is currently investigating the “GPS communication system,” which it believes to be the source of the problems, but there’s no end in sight at the moment. “Our Transit Bureau is pressing the vendor to come up with a permanent solution to the problem, but we don’t have a timeline on when the issue will be resolved,” Balliet wrote in an email. As of Friday afternoon, however, ART’s real-time arrivals web page was generally working as intended. 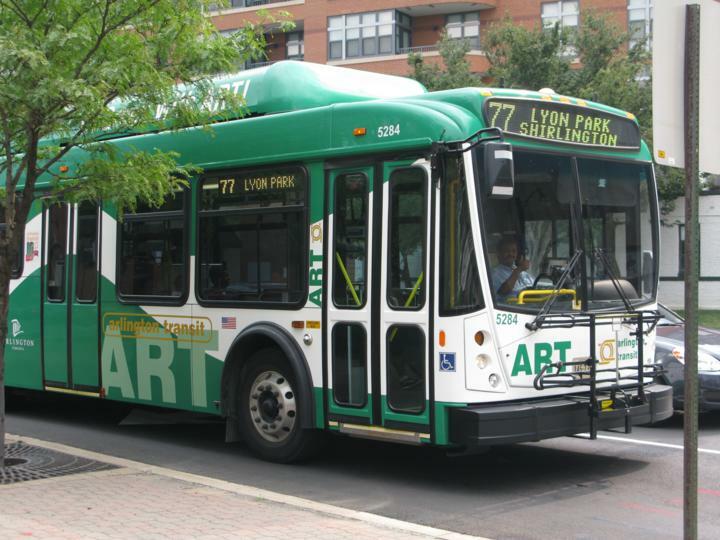 ART has also dealt with some problems with its phone system to connect disabled and elderly riders to bus service this past summer, not to mention a host of bus maintenance woes necessitating some service disruptions. 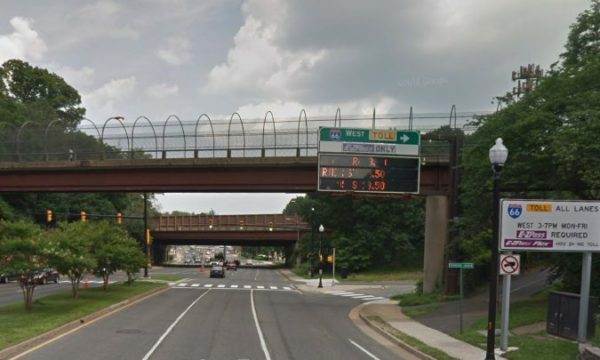 Arlington is gearing up to ask for millions in I-66 toll revenue to fund a series of changes along Lee Highway, including the creation of a dedicated bus and HOV lane along the road during rush hours. The County Board is set to sign off this weekend on funding requests for six transportation projects, totaling $6.9 million, four of which focus on reducing traffic along Lee Highway as it runs from Rosslyn to East Falls Church. This project will increase morning peak hour frequency and provide running time improvements for better on-time performance on the subject Metrobus route that connects the East Falls Church Metrorail Station with the Farragut Square and McPherson Square areas in the District of Columbia via Lee Highway and a short section of I-66 from Rosslyn to the Theodore Roosevelt Bridge. This project will add a second left turn lane from northbound Lee Highway to westbound Washington Boulevard and provide pedestrian improvements at the intersection north of the bridge over I-66, which is 0.25 miles from the East Falls Church Metrorail Station. This project will install forward looking infrared (FLIR) video cameras at key intersections along Lee Highway. FLIR technology uses thermographic cameras that improve the accuracy of vehicle, pedestrian, and bicycle detection in all lighting and weather conditions, and in turn improve optimal signal, intersection, and corridor operations and performance. This project would convert the outside lane of Lee Highway to an HOV and bus only lane through pavement treatment, restriping, and signage. The lane would operate eastbound during the morning peak period and westbound during the evening peak period only; at other times it will continue as a general purpose travel lane. The final project on the list is one that the county initially considered back in 2016 as an effort to prepare for Metro’s “SafeTrack” schedule disruptions, and the new lane would’ve run from Court House to Rosslyn. However, county transportation spokesman Eric Balliet says that lane was never constructed, and the new proposal calls for it to run from Cherrydale to Rosslyn instead. The county expects a new lane would be particularly impactful along that section of the highway because about “25 loaded buses per hour” drive along it during peak period, and they often run into heavy delays near the highway’s intersection with N. Lynn Street in Rosslyn, according to the report. In addition to the Lee Highway changes, officials are also hoping to earn $750,000 to add a new traffic light to the Washington Blvd entrance to the East Falls Church Metro station, as well as crosswalks and other pedestrian improvements at the intersection. Finally, the county plans to ask for a total of $1.3 million over the next three years for “enhanced transportation demand management outreach” along the corridor, educating commuters about public transit and other strategies for getting cars off the road. The Board is set to approve these funding requests at its meeting on Saturday (Dec. 15), and the NVTC will accept applications through Jan. 16. The organization plans to hand out $20 million in funding across the region through the program next year. 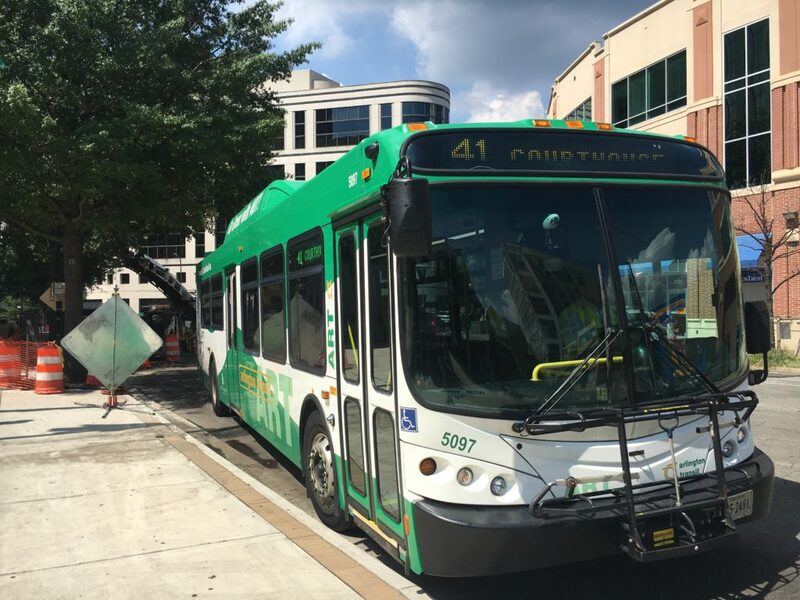 Commuters to, and through, Arlington from Northern Virginia’s western suburbs will soon have a new bus option. 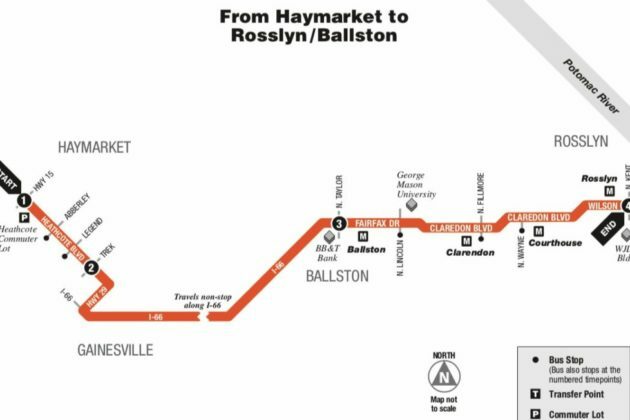 The Potomac and Rappahannock Transportation Commission, commonly known as PRTC, is starting up a new bus route to connect Haymarket to stops along the Rosslyn-Ballston corridor. Starting Dec. 17, buses will stop at four locations in Haymarket, including a soon-to-be-completed commuter parking lot, and five stops in Arlington. The new “OmniRide” route, approved by PRTC’s governing board earlier this month, will provide the first direct link between western Prince William County and Arlington’s urban core. 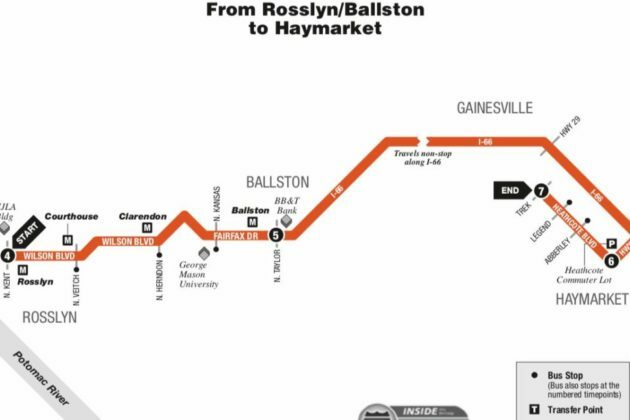 PRTC currently runs buses connecting Woodbridge to Rosslyn, Ballston and Crystal City (and one route linking Gainesville to the Pentagon), but commuters along I-66 previously had to hop on Metro or another bus to reach the area. Del. Danica Roem (D-13th District) expects that the new bus route will be incredibly meaningful for her constituents in her western Prince William district — so much so that she says she was “over-the-moon ecstatic” when she heard the news that the route was becoming a reality. Not only does she expect it will help Haymarket residents commuting to the Pentagon or other jobs around Arlington, but she sees plenty of local benefits too. 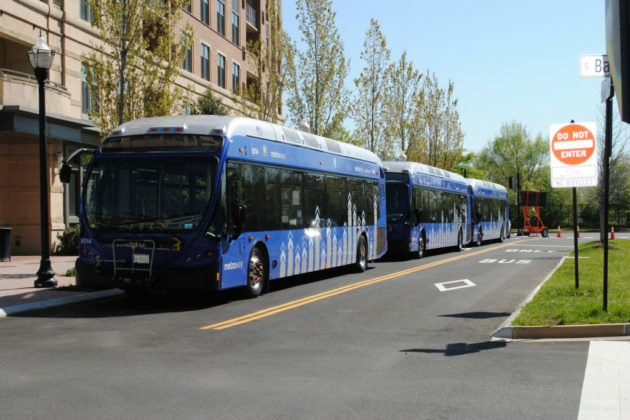 The PRTC bus will provide yet another option for people traveling between Rosslyn and Ballston, and could ease some of the relentless traffic pressure on I-66 around Arlington. 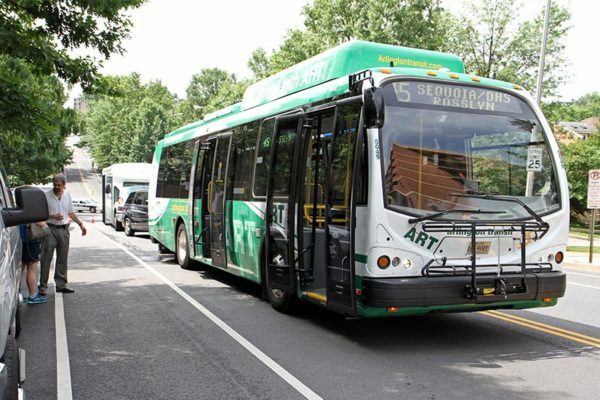 With no small degree of pride, Roem notes that the new bus route wouldn’t be possible had the General Assembly not acted to set a floor on the region’s gas tax this year, providing a stable source of funding for PRTC for the first time in years. 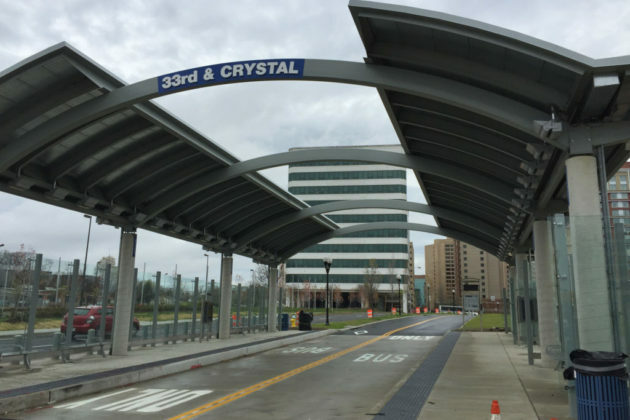 Without that provision, included in the sweeping deal to provide dedicated funding for Metro, Roem expects PRTC wouldn’t have been able to afford the Haymarket-Arlington connection until next September. However, she notes that new money will only get the new route “off the ground,” not fund it in perpetuity. Money from the I-66 tolls will eventually help keep the service running, but PRTC will still need to scrounge up additional funds until the toll money arrives, according to the transit service’s documents. Even still, Roem has every confidence that PRTC will find a way to make the math work, especially because she fully expects to be popular among riders. She notes that many commuter lots in western Prince William are already thoroughly overcrowded, so there should be a constituency for the new route right away. 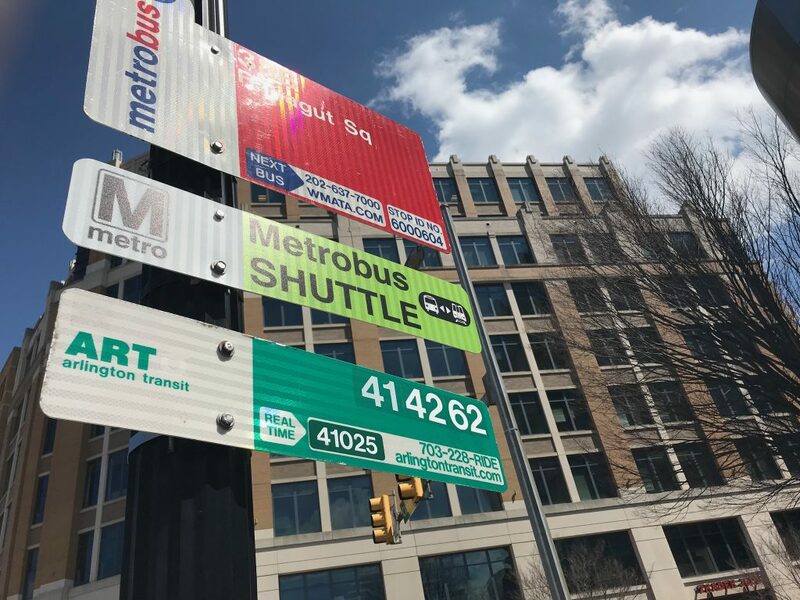 Additionally, Roem notes that Arlington Transit plans to honor PRTC’s tickets, allowing riders to easily connect from Rosslyn and Ballston to the Pentagon, or even Crystal City. Arlington Transit bus riders could see delays across several routes over the course of the next week. A spokeswoman for the county’s Department of Environmental Services, which oversees ART, didn’t immediately respond to a request for comment on the nature of the mechanical issues. 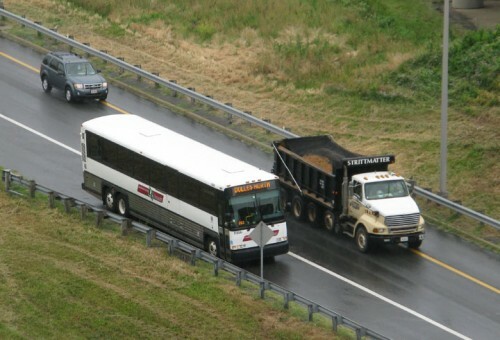 ART buses have on occasion suffered brake failures, leading to significant crashes, though it is unclear whether this week’s delays are in any way related. 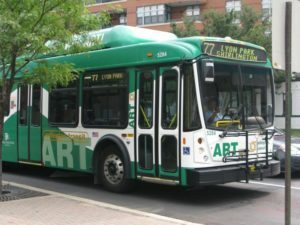 So far, buses on ART Route 77 between the Courthouse Metro station and ART’s Shirlington station have recorded several delays, and some departures have been canceled entirely, according to county service alerts. ART opened a new, $17.6 million “light maintenance facility” on S. Eads Street last fall, and the county is planning to someday open a “heavy maintenance facility” in Springfield, after the County Board approved the purchase of a site there for $4.65 million. 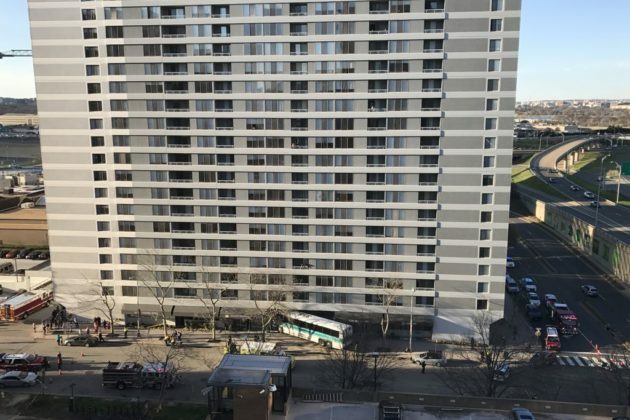 (Updated at 9:35 a.m.) A PRTC commuter bus smashed into the side of the Lenox Club apartment building in Pentagon City Wednesday evening. 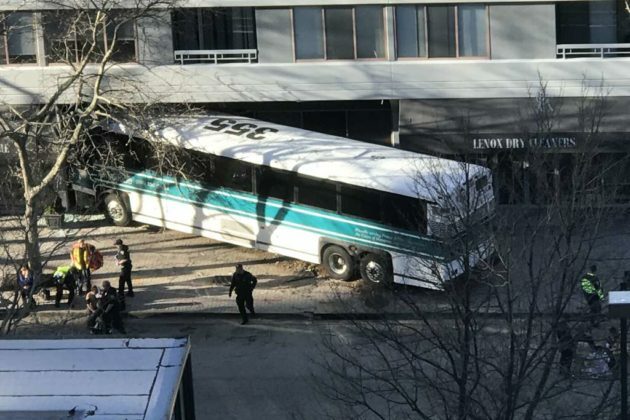 The crash happened just before 6 p.m., along 12th Street S. The bus, which was not carrying passengers at the time, hopped the curb, struck the front of a convertible and ran into a storefront on the side of the building. Three people were transported to the hospital with non-life-threatening injuries, according to Arlington County Police spokeswoman Ashley Savage. Among those injured were the bus driver, a pedestrian and one person who was inside the building, Savage said. 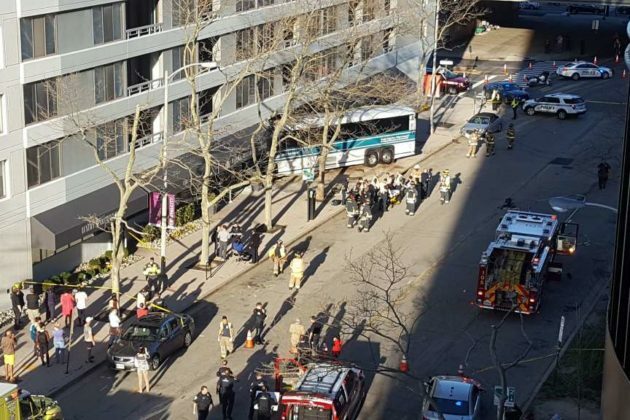 Structural engineers have been called to inspect the base of the high-rise building, which remained open for residents. 12th Street S. between Army Navy Drive and S. Eads Street remains closed while police investigate the crash. No word yet on whether the driver will face any charges. 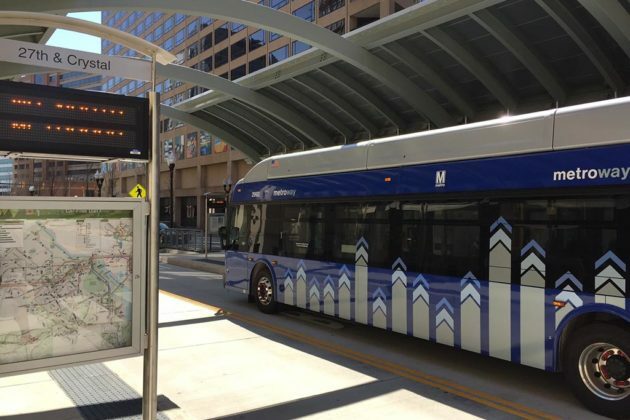 Arlington is launching new bus routes — serving rush hour commuters between Crystal City, Rosslyn and Courthouse — next Monday. ART 43 will run from the Crystal City Metro Station to the Crystal City VRE station and Rosslyn and Courthouse Metro Stations between 5:55 a.m. and 8:55 a.m. and 3:20 to 7:17 p.m. starting March 31. The bus will only run during rush hour on weekdays; there’s no planned off-peak or weekend service yet. The bus schedule indicates a 20-minute travel time from the Crystal City Metro stop to Courthouse. The new bus is designed to serve as an alternative to the Blue Line. On the same day, Metrobus is launching two bus lines of its own — called 10R and 10S — that will travel between Crystal City and Rosslyn. Arlington says the three lines will combine to ensure a bus going to Rosslyn from Crystal City will be available an average of every 10 minutes. Bus Parking on a Highway On-Ramp? Every afternoon for the past week — and quite possibly for longer than that — this Loudoun County Transit bus has parked itself on the right shoulder of the busy ramp from Route 110 to Route 1 in Pentagon City, forcing cars to veer to the left as they drive by. Other commuter buses in the area like to idle on the side of bumpy, narrow Old Jefferson Davis Highway while waiting to pick up passengers in Crystal City, but for some reason this bus likes the on-ramp. There’s got to be a safer place to park, right?